The most seemingly simple chores are the ones many of us get wrong. Case in point: Cleaning windows. It may look easy, but in fact, even the most experienced spring cleaner could benefit from a refresher course on how to clean windows. It’s spring, the season for cleaning. Washing windows is at the top of our list. Many commercial window-cleaning products are available, all of which promise to impart a “streak-free shine.” But we have found that a simple solution—one part white vinegar to two parts water—is perfect when mixed up in a spray bottle. Fill a bucket or large pot with clean, cool water and add a few drops of liquid dish soap. Place a large bath towel beneath the window to catch any spills. Use a clean microfiber cloth or sponge to go over the surface of the window, starting at the top and working down to the bottom. Don’t forget to wipe down the frame as well, both inside and out. Spray the window thoroughly with the vinegar and water solution, or if you prefer, a commercial window cleaning product (Zep or Windex work well). Another option is mixing one capful of ammonia with two gallons of water. Using a clean, lint-free towel (or the black-and-white pages of a newspaper), dry the window completely using a Z-shaped motion. You also can use clean paper towels to dry the windows, if you prefer. 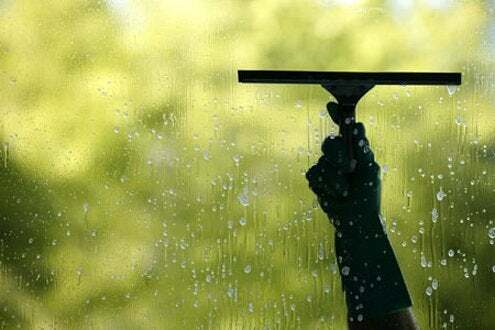 It is best to work on a cool, cloudy day so that the soapy water and window-cleaning solution do not dry on your windows. Outside windows typically have more dirt and stains. Start by rinsing the windows with the hose, then fill a bucket with clean, cool water and add a few drops of liquid dish soap. Using a soft microfiber cloth, go over the surface of the window. For higher windows, use a sponge mop (or a soft cotton or microfiber mop) on a pole. Rinse thoroughly with the hose. Spray or mop with the vinegar and water solution or with a commercial cleanser. Wipe the window dry using a clean, rubber-bladed squeegee. Angle the squeegee towards the bottom of the window and work from top to bottom. Wipe the squeegee with a clean, dry towel at the bottom of each pass. Alternatively, you can use a clean, lint-free towel or newspaper pages to dry the windows. For stubborn dirt and stains, including bird droppings, saturate thoroughly with vinegar and water and let stand for several minutes before drying. You can also try rubbing with a soft “scrubbie” sponge, but do not use steel wool or harsh scrubbing cloths; these will scratch the window. Don’t neglect the window screens. Rinse with plain water, spray with a vinegar and water solution, then rinse again with plain water. Let dry thoroughly before replacing the screens on the windows. Sometimes windows will be stained with mineral deposits, particularly in areas with hard water. There are several methods for how to clean windows like these. For instance, commercial cleansers can be used on these stains, including CLR, which removes calcium, lime, and rust stains. Follow the manufacturer directions when using these products. Although cleaning windows can be a “pain,” it is worth it to be able to enjoy unobstructed views… and let the sun shine in!